Ambulance Red, Ambulance Orance, Ambulance Pink, Ambulance Chartreuse. This hot resin series is one of the coolest uv resin series ever made for fly tying. These products Use UV light for making the effect. Use UV light or normal flashlight to activate phosphorus. 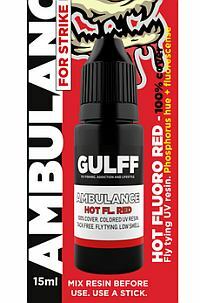 Gulff Ambulance Red Resin is designed for strike points. The colour is also perfect for winter fishing use. Resin covers 100%. Resin contain high fluorescense and phosphorus ingredients. Hot spots glow under UV light and in the dark. 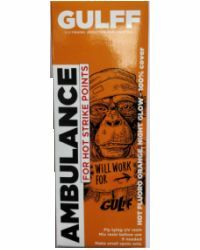 Gulff Ambulance Orange Resin is designed for strike points. The colour is also perfect for winter fishing use. 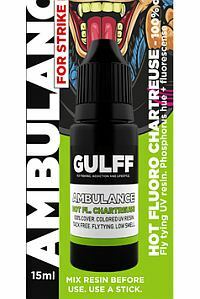 Gulff Ambulance Chartreuse Resin is designed for strike points. The colour is also perfect for winter fishing use. 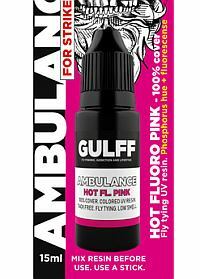 Gulff Ambulance Pink Resin is designed for strike points. The colour is also perfect for winter fishing use.